2008 Kirkvold Reunion - It's this Weekend! Bring your kids, bring an Ole & Lena joke, homemade pie (I like that), chicken, a friend. It's going to be a beautiful day. Come and enjoy this great big family we are all so lucky to have. Artfalls 2008, 9 a.m.-6 p.m. Saturday, Falls Park. Artfalls 2008 is a fine art festival with visual, culinary, and performing artists along the falls of the Big Sioux River. www.Artfalls.com. St. Paul Saints v. Canaries baseball, 7:05 p.m. Saturday, with kickball giveaway. www.canariesbaseball.com. (From left) John Kirkvold, Ingeborg Olsdatter Refset Kirkvold, Dordi Pedersdatter Fjetsethaug Kirkvold, Hans Kirkvold. Photo taken near Hendricks, Minnesota, in the early 1900s. 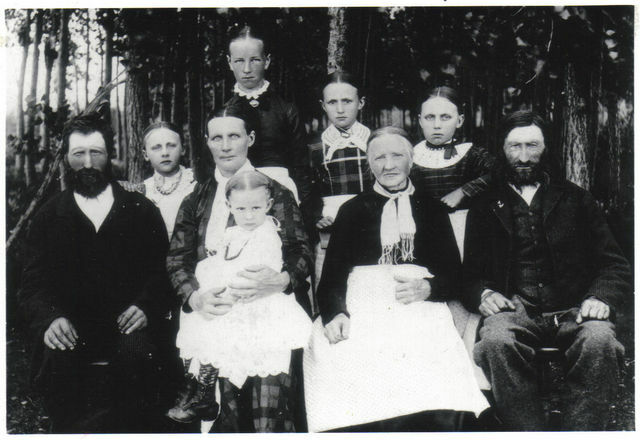 We are the descendants of Hans (1821-1908)and Dordi Pedersdatter Fjetsethaug (1820-1894) Kirkvold, who emigrated from Singsås, Norway (), in 1881 to Hendricks, Minnesota. Their children are Jon (1843-1910), Siri (1855-1939) and Mali (1859-1941). Jon and his wife Ingeborg Olsdatter Refset (1850-1919) came to Hendricks in 1879. Seri and Mali ended up in Yankton, SD, then Dakota Territory, with Seri's husband Iver Arntsen (1853-1948). Siri and Mali eventually settled in the Bloomfield, South Dakota, area near Platte in the early 1890s, where Mali married Andrew Nelson ( 1859-1906). Jon was 36 when he came to the United States. Siri was 24 and Mali, 21. Descendants of John, primarily, have held reunions in Sioux Falls and Hendricks since at least the 1960s. Descendents of Seri and Mali have also attended, although in fewer numbers. NOTE: Visitors to this site are temporarily unable to log on. The site was trashed last winter by unknown users and some changes need to be made before allowing family members to make changes and addition. I'll get this going again this summer.